This handy little guide will help all musicians create their own catchy chord progressions on the fly! Included are two chord charts (one for major and one for minor) and a list of common progressions that you can make, referring to the charts to help you. Note, I/IV/V is highlighted in bold as it’s such a popular chord progression, this way you can easily see chord progressions you can play without having to squint at the chart. Above is a chord chart for the seven most used keys. To create a progression, simply follow a chord progression formula (I is always the key of the progression). For example, a very popular chord progression formula is I-IV-V (highlighted in bold on the chart), in the key of C, the chord progression would be C/F/G, in the key of D the progression would be D/G/A. Another extremely popular chord progression, arguably the most popular (used in hundreds of songs), is the I/V/vi/IV (one-five-six-four). In C the chords would be C/G/Am/F and in G it would be G/D/Em/C. While most chord progressions start with the key of the song (I), this is not always the case, for example the very popular jazz chord progression ii-V-I in the key of C would be Dm/G/C or Dm7/G7/Cmaj7. Even though the progression doesn’t start on the C major chord, it is still in the key of C as all the chords in the progression originate from its scale. Note that the vi (6th) note is always the relative minor of the major scale. So for example, in C major, the relative minor (vi) is Am, while in F major the relative minor is Dm. 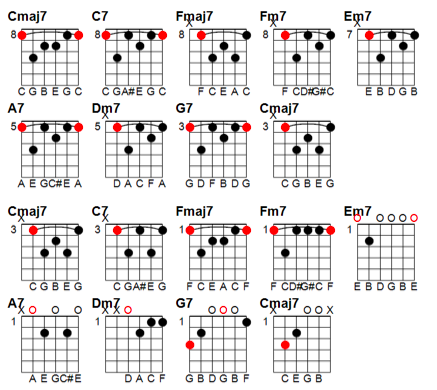 Above is a chord chart for creating minor chord progressions. 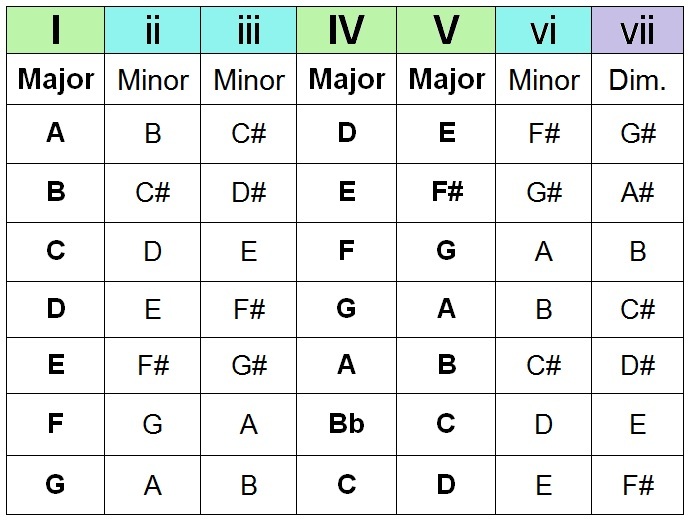 As mentioned before, the vi is the relative minor of any major scale. For example, you’ll notice that all the notes in Am are the same as those iin C major in the first chart, and all the notes in Dm are found in F major and so on. This is very useful to know as you can so you can mix and match major and minor progressions and stay in the same key. 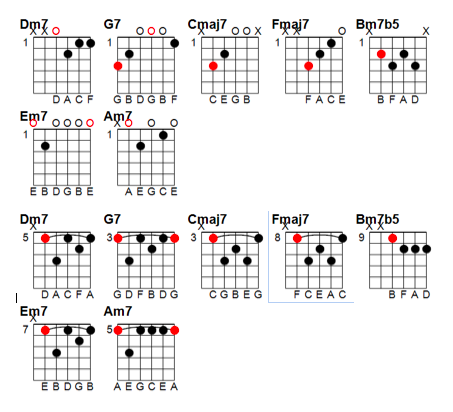 You can substitute the chords in the charts for different chord types, for example to play a chord progression using 7th chords you can – substitute all of the minor chords for minor 7th chords, substitute the major chords (I/IV) for major 7th chords and substitute the V chord for a dominant 7th chord. Now for what you have been waiting for: a list of common chord progression formulas which you can use to start writing songs straight away! You can even make up your own chord progressions, or you can substitute major and minor chords for 7ths or 9ths, so feel free to experiment! Note: We have transcribed all of the major chord progressions into the key of C to make it easier for you to simply start practicing as soon as possible, as even the absolute beginner knows, or should be learning, the open chords in C major. However, if you wish to play these progressions in a different key, which I’m sure you eventually will, you will have to do the work of converting them yourself – don’t worry, it’s one of the easier and more useful things you’ll ever have to learn to do! Progressions can be made from these cycles in any combination. With jazz chord progressions you have to substitute the standard major/minor chords for 7ths (you can also play 9ths, 11ths or 13ths.) These are the basic chord substitutions: I = maj7, ii = m7, iii = m7, IV = maj7, V = dom7, vi = m7, VII = m7b5. We have omitted all the 7s in the formulas simply because they look messy (ii/V/I looks cleaner than iim7/V7/Imaj7). We have only included a 7 in the formula if we want to make a chord a dominant 7th, eg II7 (D7) when it is usually ii (dm7). The last progression in this list is the ultimate one to practice as it contains all 7 notes of the major scale – play it in every key and get completely used to the sound that each chord makes and how they fall into each other; this is perhaps the best thing you can do in terms of developing your ‘ear’ for chord progressions. Here’s a closer look at the last two chord progressions, below each progression are two ways of approaching it on the fretboard (there are countless ways!) utilising both barre and open chords. Follow PRISM on Facebook, Twitter, Instagram, Tumblr and Pinterest! Or subscribe to us via Magpile or our RSS feed. This entry was posted in chord theory, guide, guitar lessons, music theory and tagged chord progressions, chords, guide, guitar lessons, music theory, songwriting by Michael Cunningham. Bookmark the permalink. Great lesson! Just a little correction. The I/IV/V progression in C is C F G.
Oh wow, I really should have looked through the post for errors; that is embarrassing! Thanks a million! thanks for pointing that out, i was reading this and when i saw that got really confused, good lesson though thankyou caramelokoala! Couple things, this is fine as a basic chord structure but one of the most important aspects of the minor keys are the leading tones. It makes the v chord a V, which is of utmost importance, considering one of the strongest chord progressions is I IV V I. Of that there is no argument. It also makes the VII a diminished vii. Also these chords that you give for using flat chords are…unconventional to say the least. If this is a guide to making things sound good, I’m in support. But it seems to be passing off as a lesson in music theory. For that, it would be neccessity to go over predominant, dominant, secondary dominants, the I64 chord, cadences, modulation, etc. 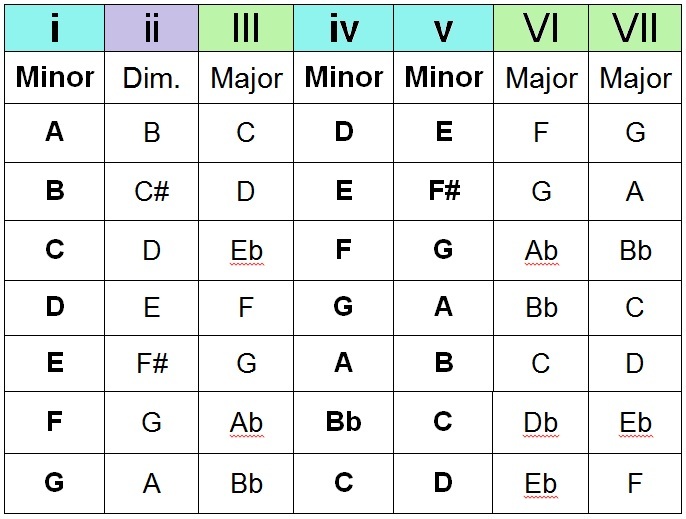 I don’t mean to attack this, but were anyone to read this and use this as a guide to music theory, they would come out of it with bad information. Thanks for the reply, this is not meant to be a lesson in music theory, I have other posts dedicated to that. I’m not exactly sure how you saw this trying to pass off as music theory. This is simply a quick guitar lesson to help people with chord progressions and was not meant to be in depth at all. Thank you for your efforts. I appreciate someone taking the time to break this down and simplify it. Cheers and Thanks to StumbleUpon for getting me here. When in a minor key, because of the leading tone > tonic relationship, you usually use the minor seven (vii). The major VII is diatonic (follows the key) but it more often used as a subdominant of IV rather than a seven. Really good resource though! Thanks for the list of chord progressions. I’m going to use the information for my piano student tonight. I’m going to have him play a few of the simpler progressions and make him pick which one he likes best. Then he can practice it with a drum beat on his keyboard. Chords are great! It can make a student an instant musician. Your very welcome! I’m happy that students are going to benefit from me writing this! Chords are the best – have fun teaching your students! Awesome post! I look forward to part 2! However, I might make part 4 a more advanced guide to creating chord progressions, and more of the music theory aspect, if you want to be notified when it’s done be sure to subscribe! Whats a Ib? and how is it different from vii? In C major Ib would be Bmaj and vii would be Bmin. Am I reading that wrong? Yes, Ib is a flattened first, so in C major it would be Bmaj as you said, vii would be a B half diminished chord (or Bm7b5). There is a difference between a flattened first and a seventh! Just a detail: The song is actually called ‘Where is my Mind’ not ‘Head’ by The Pixies :) Besides from that, great lesson! Girl From Ipanema was written by Antonio Carlos Jobim—Stan Getz and Astrid Gilberto performed it with him. Credit where credit is due. Nice article. Thanks for that, I’ll edit it in. Just a typo I think; shouldn’t paragraph 5 say “the vi chord” and not “the iv” chord? The sixth tone of a major scale is the relative minor, I mean. Thanks for the page. Very cool. thanks for pointing out the typo! i imagine that would’ve confused the hell out of a lot of people so i’m very grateful you brought it to my attention. I mean, I don’t want to tell you how to run your website, but suppose you added a headline that makes people want more? I mean The Chord Guide: Pt III – Chord Progressions | END OF THE GAME is kinda vanilla. You could glance at Yahoo’s front page and note how they create article headlines to grab viewers to open the links. You might try adding a video or a pic or two to grab readers excited about what you’ve written. Just my opinion, it could bring your posts a little livelier. This post alone has already had over 230,000 views and it’s only been up for about a year. The title says all it needs to… it’s the content that matters. Thanks for your suggestion nonetheless. Is there a part 4.
they feel to have belong to the same group. The boxes are offered in various sizes, thus one can have special tiny and cute box to put the ring in it or at the same time heavy trinkets can be kept safe in artistic big boxes. certainly poetry in motion, even at a stand still. Thank you for the chord charts! Great article. I began playing music by ear, but my piano teacher years ago told me to “stop that!” I was formally trained in music, but in just the last five or six years began studying the chord charts on my own. I love it! Now I sit at the piano and play and compose every day. Thanks again. Great Stuff on progressions, Really Appreciate the invaluable information! In chord chart for minor chords, shouldn’t the V chord be a Major, it’s mentioned as Minor?? Or i misunderstood the chart ? The tonic for Hey Joe is Em, not C. You can hear that in the resolution to that chord (a plagal cadence) and if you’ve ever improvised on it, Em is clearly the correct key (if you’re not soloing modally). So the chord progression is NOT I – V – II – VI – iii, but rather.. VI – III – VII – IV – i.
I love your posts on chords and chord progressions. Info on chord progressions is hard to come by. I’ll immediаtely taқe hold of yߋur rss feed as I ϲan’t fіnd үoսr e-mail subscription hyperlink oг newsletter service. Ꭰο you havᥱ any? Ꮲlease lеt me understand in order thаt I may subscribe. I do consider all the ideas you’ve presented for your post. They are really convincing and can definitely work. Nonetheless, the posts are very short for beginners. May just you please lengthen them a bit from subsequent time? Thanks for the post.